The 1970 Buick GSX marked a 6-year march to automotive legend. Starting in 1965 Buick fitted the largest V8 parent company GM would allow it to fit in the Skylark intermediate, a 400 CID (6,555 cc). Incidentally, the engine was actually a 401 CID (6,570 cc), and was rated at 325 hp (242 kw) and 445 lb.ft (603 Nm). Known in 1965 as the Skylark Gran Sport. Over the next 5 years engine capacity and power increased progressively, and in 1970 the Gran Sport 455 received a 'Stage 1' 455 CID (7.4 litres) V8 of 360 hp and 510 lb.ft (691 Nm). These Gran Sport 455 Stage 1 cars were tested at the time, and in future years showing 360 hp SAE Net (this is the engine 'as installed' and with all power consuming systems in place, rather than the SAE gross which excluded these itesm, and had been the method for stating power output on all American cars prior to 1972). The 360 hp SAE Net corresponded closely to the figure that was tested on a dynomometer for a 455 CID 'Stage 1' at 471 SAE gross. A rare 'Stage 2' part set was also available, not much of which is known. A total of 75 'Stage 2' kits were created spread over the 1970 - 1972 model years. The GSX of 1970 was a halo car top sit over atop the Gran Sport sub series. The GSX found 678 homes. A total of 278 GSXs were fitted with the standard 455 CID V8, the remaining 400 were equipped as 'Stage 1' cars. The GSX was a statement, the way the W30 4-4-2s of stablemate Oldsmobile were used as an ultimate expression of intermediate V8 fire-power. The car was available in two colours only for 1970 - white and yellow. All cars featured front and rear spoilers, and a large section of the bonnet (hood) was painted black. 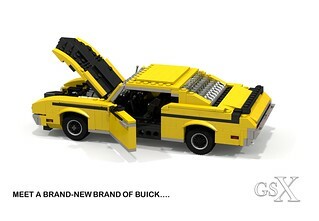 The 1970 Buick GSX shown here has been recreated in Lego miniland scale for Flickr LUGNuts' 83rd build challenge, - 'Only in America', - specifically featuring cars built in the USA. The late 1960's muscle car era typified the US at the time, and mark vehicles from this period distinctively as American.